T he Autistic Self Advocacy Network is a national grassroots disability rights organization run by and for Autistic Americans, advocating for systems change and ensuring that the voices of Autistic people are heard in policy debates and the halls of power. Our staff work to educate communities and improve public perceptions of autism. As a 501(c)(3) nonprofit organization, ASAN relies on your donations and support to carry out our work. 2015 was our fourth year as a formally-designated 501(c)(3), and we take great pride in the work we’ve done. 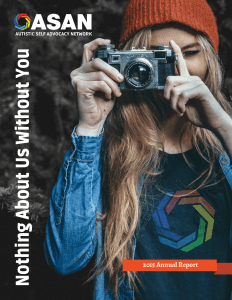 To better inform our supporters about the work that your contributions make possible, we invite you to read our first-ever 2015 Annual Report: Nothing About Us Without You. More information about our 501(c)(3) designation, including past Forms 990, is available here. This entry was posted in Autistic Community and Allies, Blog and tagged autistic community, self advocacy. Bookmark the permalink.